SurfStitch is one of Australia’s largest online retailers and the largest retailer of surf gear, action sports fashion and street wear. Over 20,000 products of all the leading surf brands, winter sports brands, skate and street wear brands can be found in SurfStitch’s online shop. Not only the big names are there, but the exclusive and hard-to-find niche brands are listed here, too. Billabong, Rip Curl, Carhartt, Vans, Obey, Quicksilver & Element belong to the top brands at SurfStitch. You can buy men’s and women’s fashion, footwear, surf gear, accessories, snow and skate wear at SurfStitch’s online shop. If you want to be the first to be informed about the latest arrivals, trends and promotions, sign up to SurfStitch’s newsletter and receive a promo code which saves you $20 on your next order. Please note, that you need to spend over $100 on full price items, though. 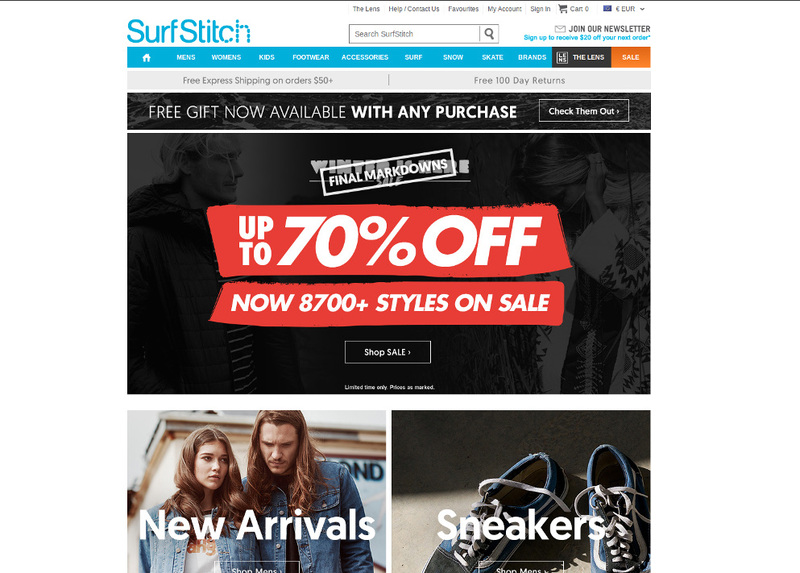 If your are looking for a SurfStitch coupon code or the latest sales promotion, CouponDeals.com.au is the right place to be. It may sound like a cliché but this is the real story: A couple of years ago, two surfer dudes were dreaming about becoming Australias most important surf gear online retailer. Having been involved in the scene for more than 20 years, the two founders recognized a void between local surf stores and online shops. Today, SurfStitch has become an awarded worldwide operating retailer of surf, skate and winter fashion for her and him with departments in Europe and the U.S..
SurfStitch stocks all the well known brands such as Rusty, Inside, Nixon, Billabong, Quicksilver, Element, Tigerlily and Von Zipper. Guys stuff includes Tees, Jeans, Boardshorts, Caps, Beanies, Watches and WalkerShorts. Girls find everything from Bikinis, Dresses, Singlets, Skirts, Handbags to Thongs and Shoes. Did you know, that SurfStitch ships for free, if you purchase for $50 and more? Take advantage of this fantastic offer and consider adding another item to the basket, if you’re already close to the $50 mark. Zero shipping costs for orders over $50 applies to express delivery and signature delivery options. SurfStitch is amongst the most trusted online fashion stores in Australia. Consumers rate the store on average at 3.6 stars out of 5 possible stars at ProductReview.com.au. Seldom, there are some complaints about insufficient customer service at SurfStitch. From our perspective, some of these complaints refer to situations which have obviously happened outside the range of SurfStitch’s influence, for example shortcomings from the delivery service provider. We’ve spotted a negative rating or two referring to individual coarse reactions of customer service staff. Consumers at eStoreReview confirm the very positive ratings for SurfStitch. At the time of writing an average store rating of 4.6 stars out of 5 stars. At least as good as here, shoppers rate SurfStitch at Trust Pilot: 9.2 points out of 10 is what international users think of the retailer, e.g. in Europe. If you want to save on men’s surf and street fashion, redeem a voucher code and get an automatic discount. Once you find a porper coupon code on CouponDeals.com.au, copy the code to your clipboard and take our link to SurfStitch’s website. Here you can shop for all your surf, skate and fashion needs. Simply put the articles of your choice in the virtual shopping cart and proceed to your cart. There you’ll find a input field labeld Promo Code. 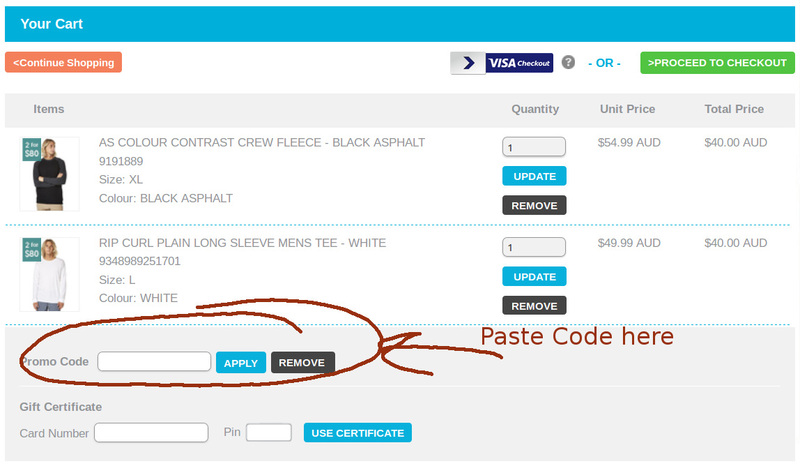 Paste your code into this field and hit the Apply Button and your discount is showing automatically. Xmas offer update: Get 20% 30% off! Take 35% off all Sale items in your order when you spend $200 on sale items. Take 30% off all Sale items in your order when you spend $150 on sale items. Applies to Sale items only. Standard Promo Exclusions apply. Get 30% off just about everything across the site on Black Friday sale! 2. Discount code entitles you to 33% off items from the Promo Category in your order. 3. You must apply the promo code (one word) in the bottom of your cart to receive the 33% discount. 4. SurfStitch has no obligation to advise an entrant of an incomplete or otherwise non-compliant entry. 5. Only one (1) promo code can be applied to a single order. This includes free gift offers requiring a promo code to be applied. 6. If you are unsure how to complete this promotion, please contact customer service before finalising your order. Promotional offers will not be honoured unless the relevant code has been applied in the cart and no refund will be offered if promotion was not completed correctly. 7. The promotion cannot be applied to an order that has been completed, nor can the 33% discount be applied to an invalid order. 8. Promo only applies to products in the following category: Promo Category. Womens jeans $50 and pants $30 only! Save big time on jeans and pants! Buy jeans for $50 and pants for $30 only. Hurry up, ends Saturday! Mens jeans and pants at $30 – $50! Scare the pants off ya! Buy jeans for $50 and pants for $30 only! 30% off nearly everything sitewide. Two days only! See site T&Cs for details! Enter our promo code to receive 40% off all SWELL and The Hidden Way product, including both full price + sale. 1. Promotional period runs from 00:00 AEST Thursday 7th September, 2017 – 11:59pm AEST Monday 11th September, 2017. 2. Discount code entitles you to 40% off all full price and sale SWELL and The Hidden Way items in your order. 3. You must apply the promo code (one word) in the bottom of your cart to receive the 40% discount on No News items. 7. The promotion cannot be applied to an order that has been completed, nor can the 40% discount be applied to an invalid order. Enjoy a further 25% off sale items! Already on sale! Now get an extra 25% off! Enter promo code to receive 25% off valid sale items in your order. Discount does not apply to: eGift cards, Physical gift cards, Gift wrap; items from the following categories: Surfboards, Softboards, Stand Up Paddle Boards, Home Wall Mounted Board Racks, Cameras, Polaroids, Bikes, Sunglasses; or items from the following brands: Billabong, Element, RVCA, Tigerlily, Kustom, Rip Curl, Hurley. You must apply the promo code (one word) in the bottom of your cart to receive the 20% discount on valid items in your order. 30% off selected Footwear, including already reduced sale items. Enter promo code PUMPED30 to receive 30% off selected footwear. Discount code expires 11:59pm AEST Friday 31st March 2017. Discount code expires 11:59pm Friday, 31st March 2017. The discount code entitles you to 30% off sale items in your order. The discount code entitles you to 25% off sale items in your order. The discount entitles you to 20% off sale items in your order. Win the trip of a lifetime to France! To celebrate the Quiksilver & Roxy Pro Gold Coast, SurfStitch customers who purchase any new season Quiksilver or Roxy product gets automatic entry into the prize draw to win the ultimate holiday to Hossegor, France, the home of the Quiksilver Pro. from SurfStitch. Only purchases on new season, non-sale/non discounted products are valid for entry. Please read full terms and conditions on SurfStitch’s web site. Discount code expires 11:59pm AEST Wednesday 8th March 2017. Hurry up for your extra 20% off Mens Sale Boardshorts! Get an extra 20% off sale Mens Tees! November 13 and 14 only! That's right! 25% off sale items in your order. Spend Over $80 on Swell items and get a free Swell towel. Must purchase Swell products for $80 or more.